No Excuses – We have what it takes to win. Great Defense – We do the dirty work. Communication – We tell each other the truth. Trust – We believe in each other. Collective Responsibility – We are committed to each other. Care – We have each other’s backs. Respect – We respect each other and our opponents. Intelligence – We take good shots. Poise – We show no weakness. Flexibility – We can handle any situation. Unselfishness – Our value is not measured in playing time. Aggressiveness – We play hard every possession. Enthusiasm – This is fun. Performance – We’re hungry. We have no bad practices. Pride – We are the best team in the world and we represent that team. 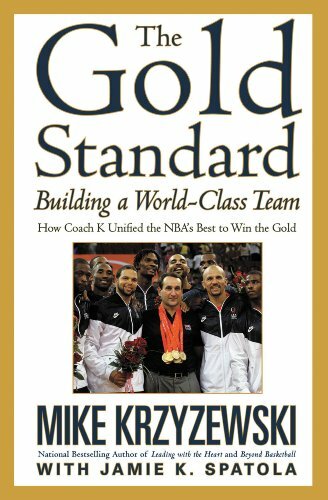 Basketball super fan or totally non-sport oriented, the “Gold Standard.” is practical yet challenging and easily applicable to our daily lives. They would be excellent “New Year’s” resolutions. What are Paul’s Gold Standards? “Everyone runs but only one person gets the prize. So run to win!” Gold Standard: Take your faith and your walk with God seriously. “All athletes are disciplined in their training.” Gold Standard: We can be disciplined in our walk with Christ. “They do it to win a prize that will fade away, but we do it for an eternal prize.” Gold Standard: The prize offered by Jesus is more than worth the price. “So I run with purpose in every step.” Gold Standard: We are called to be passionate. “I am not just shadowboxing.” Gold Standard: This is a serious calling. “I discipline my body like an athlete, training it to do what it should.” Gold Standard: Our spiritual relationship with God also calls for discipline. “Otherwise, I fear that after preaching to others I myself might be disqualified.” Gold Standard: As servants of Christ we can all do better! Gold standards can challenge us whether on the basketball court, in school, in business and especially in our walk with God. As we begin 2019, may we dedicate ourselves to following our own covenant of Gold Standards in everything we do. Happy New Year!